MetaTrader, also known as MT, is a software widely used by online forex retail traders. It was developed by MetaQuotes Software and released in 2005. The software is licensed to forex brokers who provide the software to their clients. Using MetaTrader, trader can see live streaming prices and charts, to place orders, and to manage their accounts. Has a user friendly, easy to use interface. Has MQL (MetaQuotes Language), programming language so you can create your own custom indicators. 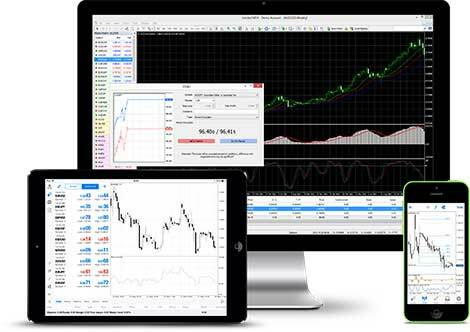 There are two MetaTrader client software versions that traders can use: Desktop and Mobile. MetaTrader desktop version can be installed in Windows based computer. While there is no official MetaTrader desktop version available for Mac OS, some brokers provide their own custom developed MetaTrader variants for Mac OS. Meanwhile MetaTrader mobile version is available on Runs on Windows Pocket PC 2002/Mobile 2003, iOS, and Android. In 2010, MetaQuotes released the latest version a successor, MetaTrader 5. However, uptake was slow and most forex brokers still support MetaTrader 4. What To Choose: MetaTrader 4 or MetaTrader 5?